An artist's concept portrays a NASA Mars Exploration Rover on the surface of Mars. Two rovers have been built for 2003 launches and January 2004 arrival at two sites on Mars. Each rover has the mobility and toolkit to function as a robotic geologist. 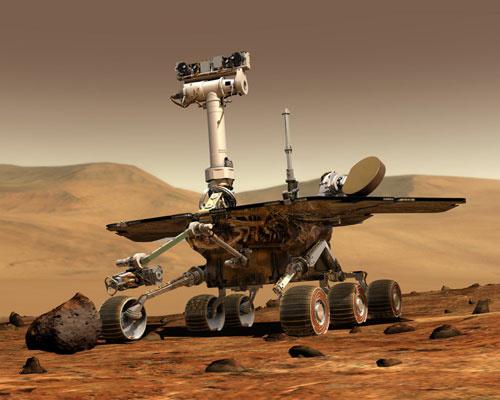 Ten years ago, NASA launched a rover named Spirit on a mission to Mars. It was one of two robotic vehicles sent that year to study the red planet. The Spirit rover taught us a lot, but as KPCC's Science Reporter Sanden Totten found, the mission almost failed right out of the gate. E3 begins: What's buzzing at the biggest gaming expo in the world?